The WenɑsɡwəllɑʔɑW (Generations Building) was established as a priority in 2007. The building will house the Senior Program, Early Head Start, Head Start and Day Care programs to move the programs for the most vulnerable of our community to higher ground, above the tsunami. Other programs sharing the new space will include MIS, recreation, and education. A large room will be set aside for the recreation program to utilize. Schematic design for this building is complete. The architect for the design development and construction drawings will start shortly. As design continues, there will be public meetings. These meetings will be posted here, as well as other locations in Taholah. 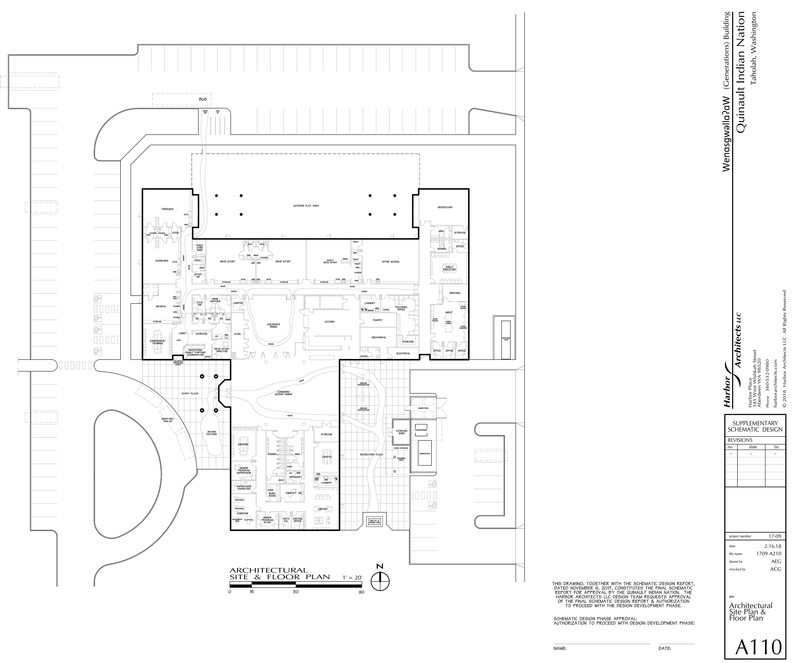 Check back at this page for updated information as the building design progresses. CLICK IMAGE TO ENLARGE. For more information or to give feedback and suggestions to the Project Team, please contact Kelsey Moldenke, Charles Warsinske or Sue Kalama by email or at (360) 276-8211, extensions 1038, 6821, or 6824, respectively. Artwork by Doug James.